Burma’s wild elephant population declines due to increased human-elephant conflict, loss of habitat and illegal poaching. RANGOON — She was born in a small ravine in Burma’s Southern Arakan mountain range bordering the Irrawaddy Division. The heavy raindrops of monsoon season were her first shower. Deep forests in the Arakan mountain range would have been her home if her mother hadn’t left her in the ravine when bamboo harvesters shooed her away without knowing they were together. The bamboo harvesters brought the wild, newborn elephant to Dr. Myo Min Aung, veterinarian and head of the Myanmar Timber Enterprise’s (MTE) Emergency Elephant Response Unit in Irrawaddy Division. He named her “Mi Kaunt Ya”— which translates to “adopted girl”. She survived for 23 days and died from diarrhea on July 3 at the Thayet-san elephant camp in Irrawaddy’s Hinthada district. “Her case is one of many consequences of human-elephant conflicts,” Myo Min Aung told The Irrawaddy, explaining how his team tried to care for the days-old Mi Kaunt Ya. He added that similar human-elephant conflicts happen in Irrawaddy Division frequently, as the region has a remarkable concentration of wild elephants. Burma is home to 4,000-5,000 wild Asian elephants and has the world’s largest captive elephant population with nearly 5,000, according to the UK-based EleAid Asian Elephant Conservation. The country’s wild elephant population has been in dramatic decline throughout the past few decades, due to loss of habitat and illegal poaching and trading of elephant body parts, EleAid said. The Ministry of Natural Resources and Environmental Conservation and the World Wide Fund for Nature (WWF-Myanmar) facilitated a workshop in Naypyidaw last week to address human-elephant conflict and conservation of the country’s wild elephant population. 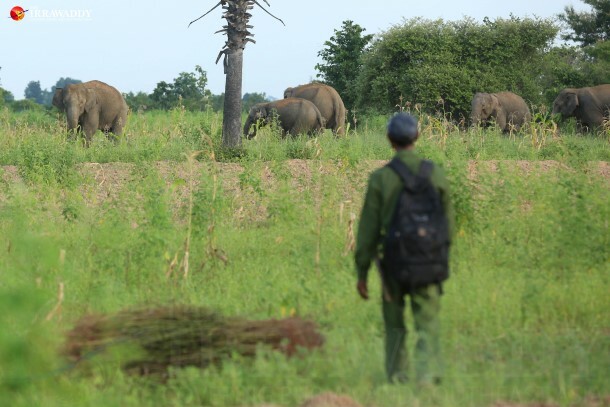 Human-elephant conflicts happen when wild elephants come close to villages where there could be paddy fields, in search of food because of the loss of their original habitat, Ye Min Thwin, WWF-Myanmar communication officer, told The Irrawaddy on Thursday. He explained that the conflict will not cease completely. But when working toward conservation efforts, people who live in communities near elephant habitats need to be educated in order to adapt their behaviors during such conflicts, he added. Conserving elephant habitats—the most effective way to reduce these conflicts—is not only advantageous to humans and elephants, but also benefits other wild animals, forestry conservation and climate, Ye Min Thwin of WWF-Myanmar said. Burma started designing the Myanmar Elephant Conservation Action Plan (MECAP) last year in coordination with international environmental conservation groups and the draft is almost complete, according to WWF-Myanmar. Last August, a group of six wild elephants got lost in central Burma and wandered around, destroying paddy fields and scaring local villagers. Officials from the forestry department had to get them back to the forest. Unfortunately, one baby elephant was separated from the group and had to be kept under the forestry department’s control. During the workshop in Naypyidaw last week, the minister of natural resources and environmental conservation highlighted the increase of land utilization and illegal hunting, which contribute to frequent incidents of human-elephant conflict. Myo Min, director of the ministry’s forestry department, told The Irrawaddy that the workshop came up with seven main recommendations including conducting surveys on human-elephant conflicts and elephant occupancy across the country, drawing standard land use maps, and forming elephant emergency response units in areas where there are frequent incidents. It is necessary to implement effective control of illegal hunting and limit access to forests in order to reduce conflicts, said Khin Maung Win, chairman of Save Elephant Foundation-Myanmar. Under Burma’s wildlife and natural area protection laws, violators can face imprisonment from three to seven years. But Khin Maung Win urged wildlife laws specifically covering elephants be enacted as well. “To control poachers, there needs to be specific laws just for elephants … not covering all wild animals, because then it’s quite generic and vague when taking legal action,” Khin Maung Win told The Irrawaddy. At the same time, it is also important that humans be aware that elephants are also afraid of them, and won’t come to villages without reason, he explained. “That’s why we need to educate people who live close to elephant habitats and train them on how to manage such incidents,” he added. For Dr. Myo Min Aung, the case of Mi Kaunt Ya was a life lesson. He confessed that he did not have experience in dealing with wild elephant calves and could not give her the veterinary care required to save her life. “I wish an incident like this doesn’t happen again or, that I am able to give proper care if it does happen again in future,” he said.